Bernard S. Bachrach (born 1939) is an American historian and a professor of history at the University of Minnesota. He specializes in the Early Middle Ages, mainly on the topics of Medieval warfare, Medieval Jewry, and early Angevin history (he has written a biography of Fulk Nerra). He received the CEE Distinguished Teaching Award from the University of Minnesota in 1993 and entered the College of Liberal Arts Scholars of the College at Minnesota in 2000. He has also been the recipient of a McKnight Research Award. He has translated the Liber historiae Francorum from Latin into English. Bachrach, Bernard S. (1995). State-building in Medieval France: Studies in Early Angevin History. Aldershot: Variorum. The Château de Langeais is a medieval castle in Indre-et-Loire, France, built on a promontory created by the small valley of the Roumer River at the opening to the Loire Valley. Founded in 992 by Fulk Nerra, Count of Anjou, the castle was soon attacked by Odo I, Count of Blois. After the unsuccessful attack, the now-ruined stone keep was built; it is one of the earliest datable stone examples of a keep. Between 994 and 996 the castle was besieged unsuccessfully twice more. During the conflict between the counts of Anjou and Blois, the castle changed hands several times, and in 1038 Fulk captured the castle again. Geoffrey I of Anjou, known as Grisegonelle, was count of Anjou from 960 to 987. Adele of Meaux was a French noblewoman. She was Countess of Chalon and later Countess of Anjou. Theobald II, Count of Blois was the eldest son and heir of Odo I, Count of Blois, and Bertha of Burgundy. Avesgaud was a French nobleman, a member of the powerful House of Bellême and was the Bishop of Le Mans from 997 until his death. His episcopate was overshadowed by his ongoing wars with Herbert I, Count of Maine. Alan was the only known son of Guerech, Duke of Brittany, and Aremberg. With his mother he founded the castle of Ancenis around 987, according to the Chronicle of Nantes. In 988, he succeeded his father as Count of Nantes and perhaps nominal Duke of Brittany, after his father was murdered by Count Conan I of Rennes. The following two years were marked by endless warfare between Rennes and Nantes. 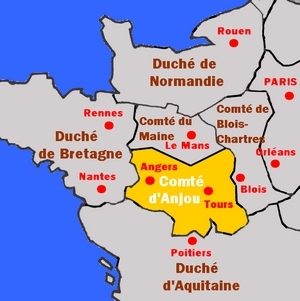 In 990, Alan died, either of an illness or else killed by Conan, who took Nantes and had himself proclaimed Duke of Brittany by the bishop of Nantes, Orscand de Vannes.